Are you dying to meet your favorite Hollywood star? Well, now you can! 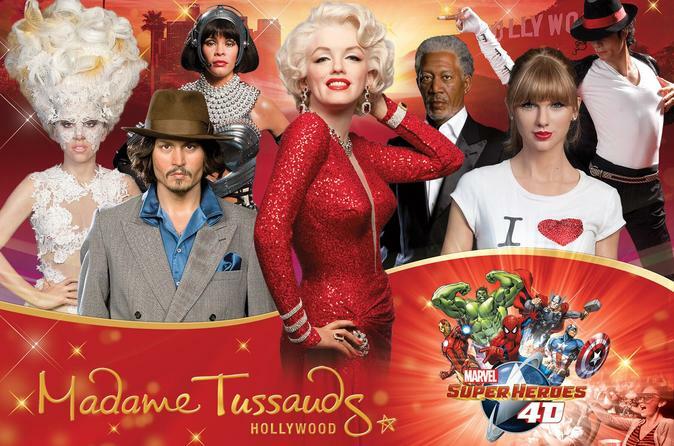 Madame Tussauds Hollywood is more than just a wax museum. It allows you to get an up-close look at your favorite famous and infamous celebrity icons ranging from the silver screen stars of the golden era through to today's contemporary stars and movie makers. With more than 100 recreations of the entertainment world's biggest names, you are sure to see your favorite! You can interact and brush elbows with your favorite celebrities, without velvet ropes or barriers between them. Step into elaborate interactive sets - as you play the role of supporting actor or actress - to create a truly unique, immersive experience. Stroll down the red carpet, like at the Oscars®, and get up close, touch and take pictures with the stars of Hollywood. Spread over three floors and 18 themed zones, there will be plenty of surprises and some truly breathtaking experiences. This is your chance to experience the real glitz, glam and elegance of Hollywood. Step onto the green next to Tiger Woods, race cyclist Lance Armstrong, meet Spiderman crawling on the ceiling of an office, cozy up to heartthrob George Clooney, perform with Beyoncé and Elton John and mix and mingle among A-list celebrities including Justin Timberlake, Brad Pitt, Julia Roberts, Jennifer Lopez, Will Smith, Jennifer Aniston, Penelope Cruz, Britney Spears and Zac Efron - Madame Tussadus has it all! This interactive wax attraction is packed with fantastic up-close photo ops, so don't forget your camera! Don't miss your chance to "meet" and take pictures with Thor, Capitain America, Iron Man and the leader of S.H.I.E.L.D himself Nick Fury. The highlight of your experience will be the 360º animated 4D cinema attraction, complete with high impact special effects from water and wind to tremors, making you ‘feel’ like part of the action! Special Offer - Price displayed includes a 35% discount off the local admission price! Book ahead and save! - Book Now!